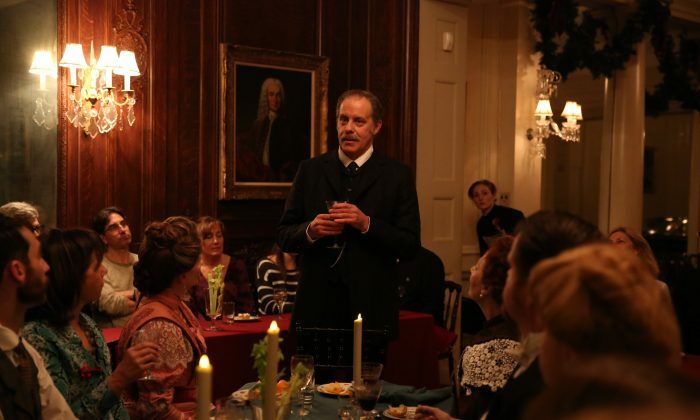 NEW YORK—The Irish Repertory Theatre’s presentation of “The Dead, 1904” makes a welcome return to the American Irish Historical Society for the second year in a row and will hopefully become a holiday tradition. Based on the novella by James Joyce, this site-specific and completely immersive production offers a poignant look at the emptiness of seemingly contented people. Upon entering the second floor of the Historical Society, via an elegant winding staircase, we are transported to the Dublin, Ireland home of elderly sisters Kate and Julie Morkan (Patricia Kilgarriff and Patti Perkins). It’s a cold and snowy evening on Jan. 6, 1904, and we’re just in time for Morkans’s annual party celebrating the Feast of Epiphany—complete with a grand piano and magnificent Christmas tree. The soirée begins the moment the audience is ushered in. Period music and singing are performed by the sisters and by their niece Mary Jane (Kimberly Doreen Burns)—all three music teachers—as well as by one of Mary Jane’s students (Megan Loomis). Burns in particular has a wonderful singing voice. Dressed in their holiday best, the guests (audience included) are invited to a sumptuous feast. The mashed potatoes or spuds (as they are called here) are particularly tasty. Irish whiskey is available beforehand and port afterwards, or apple cider and water for those not alcoholically inclined. 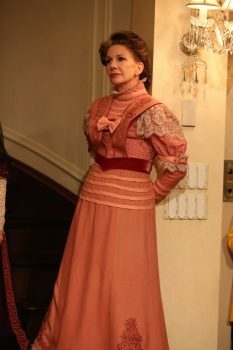 Among the guests are Gabriel Conroy (Rufus Collins), a teacher and nephew to Kate and Julia; his wife Gretta (Melissa Gilbert); Bartell D’Arcy (John Treacy Egan), a rather renowned tenor, who is currently “as hoarse as a crow”; Mr. Brown (Peter Cormican), a Protestant in a field of Catholics; feminist Molly Ivors (Aedin Moloney); and Freddy Malins (James Russell), a friend of Gabriel’s and a drunkard, despite having recently “taken the pledge” at the insistence of his mother (Terry Donnelly). The audience is seated just feet away from the actors, or, as during dinner, right next to them. Adaptors Jean Hanff Korelitz and Paul J. Muldoon, following Joyce’s lead, explore how our perceptions are colored by the ghosts of the past, for as the play unfolds, it becomes clear that none of the characters are truly happy. Some long for something long gone; others harbor a deep-seated denial. Gabriel attempts to distance himself from his Irish roots, which is a sore point between him and Gretta, who would like nothing more than to return to her childhood home in Galway. Molly chastises him on this point and takes him to task for daring to write for a British newspaper. She has not forgotten how the Irish have suffered under British rule, remembering the great famine of the 1840s, something Gretta recalls her mother speaking about, too. This undercurrent of unease persists, whether the group is discussing opera, childhood events, or people who happen to be of a different color. Freddy’s inebriation is a particular source of embarrassment to all, even as they reassure his mother that her son’s condition is hardly noticeable. As for Gabriel, he will soon find his sense of identity threatened by a secret his wife has been keeping since before they first met. It causes him to question the very nature of their relationship. Rather than providing back stories for each character, the story slowly reveals pertinent information about them through conversations, making it necessary to pay close attention at all times. Director Ciaran O’Reilly handles the material perfectly, letting events and moments slowly build until each of the characters becomes achingly real and alive. There is not a hint of the drabness that sometimes accompanies a period piece such as this. Gilbert is alternatively stoic and heartbreaking as Gretta, a woman fighting to stop her past from consuming her. Collins cuts a strong figure as the determined Gabriel. He never looks backward or inward until what he thought was strongest in his life is pulled out from under him. Moloney works well as Molly, a woman determined to remember the past, while making sure not to be held hostage to it. Russell is very good as Freddy, the actor imbuing his character with a large dose of pathos and a bit of quiet dignity. Kilgarriff and Perkins make genial hosts. Their characters are happy in their duties, yet they carry a hint of sadness in that there isn’t something more in their lives. Julia, the oldest, notes the passage of time; Mary Jane seems to be headed down the same road as her aunts. Offering a walk down a shadowed memory lane wrapped in the brightness of a holiday celebration, “The Dead, 1904” makes for a truly unforgettable experience. Just don’t forget to try the bread pudding! Also in the cast is Clare O’Malley.